Katie writes about her experience doing dramaturgical research for the Round and Round the Garden edition of A.C.T.’s performance guide series, Words on Plays. And her correspondence with Simon Murgatroyd, personal archivist to playwright Alan Ayckbourn, which grew out of that research. Dramaturgical work on a play is an interesting process. It begins (of course) with reading the play, but it’s a different kind of reading from reading for pleasure or critical evaluation, a deeper reading informed by the question: What information would deepen the audience’s experience of this playwright’s work? After the reading comes the research. Which begins, like most research nowadays, with a Google search and quick trip to Wikipedia, but quickly extends to trips to the library and explorations of the archives of obscure literary journals in a quest to bring our audience precisely what can’t be found with a Google search and a quick trip to Wikipedia. It was in the initial stage of research into Round and Round the Garden that I discovered the official Alan Ayckbourn website: www.alanayckbourn.net. Now it’s not unusual for a playwright to have a website, but this is a treasure trove—an overwhelming wealth of information so specific that the researcher in me got a little a teary-eyed and I was forced to take a few breaths to regain my composure. Not only does the Ayckbourn website contain the usual short biography, playwright’s résumé, and list of produced work, but it also offers an in-depth history of the writing of the plays, histories of their development and production, frequently asked questions about the playwright and his work, and (be still my heart) a list of interviews conducted by Ayckbourn, indexed by publication year and by the subject of the interview—as well as many more resources and links far too numerous to be listed here. The discovery of a website (even a well-researched and thorough one) does not mean my job is done, however—far from it. The discovery of this website was like finding a cross between a road atlas and detailed treasure map, complete with multiple Xs to mark the spots, as well as highways, signposts, and points of interest along the way. Using this website as a jumping-off point, I was set to map out my journey, from the location of newspaper articles published back in the late 1960s to the titles of the books that needed to be at the top of my library reading list. However, good research is also conducted with a degree of skepticism. Any article or essay is only as strong as the accuracy of its source material, which is an issue that begged the question: Is this website hosted by an Alan Ayckbourn superfan spending long hours in his basement lair, or a respected authority with a researcher’s ability to collect facts while retaining a degree of objectivity? My answer came in the form of Simon Murgatroyd, Ayckbourn’s personal archivist and website administrator (a full-time paid position), who is, in fact, a little bit of both—two parts completely qualified researcher and recognized Ayckbourn expert, and one part dedicated superfan. How do I know this? I e-mailed him. A lot. 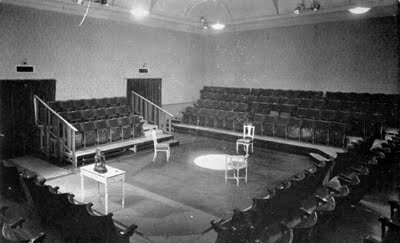 In 2004, Murgatroyd took over the position of archvivist for the Stephen Joseph Theatre, and when Ayckbourn stepped down from his post as artistic director in 2009, Murgatroyd’s position was altered to that of Ayckbourn’s personal archivist and website administrator. He lectures on the playwright’s work, continues to write and publish articles, and has published a book, Sight Unseen, which explores Ayckbourn’s unpublished and undeveloped works. All of this information (available on the website) firmly established Murgatroyd as much more than a mere basement-dwelling superfan. This alone would have been cause for much rejoicing on my part, except that Murgatroyd’s email address is also available on the website, along with an invitation to contact him with any Ayckbourn-related questions. For the second time in one day I was forced to take a few deep breaths and calm my trembling fingers, already itching to attack my keyboard in a frenzy of Round and Round the Garden–related questions. But I didn’t want to embarrass myself or annoy Mr. Murgatroyd with questions the answers of which could be easily found in other sources, so I began my research and started small with a nice introductory email inquiring about the reprint rights to some of his materials and a quick question about the pronunciation of Ayckbourn’s name. Is it “ack-born” (“ack” rhymes with “pack”) or “ache-born” (as in “headache”)? I received an answer to both of my queries in exactly four and one half minutes: Yes, we could reprint the requested materials, and it’s “ache-born.” (rhymes with headache). Thus began my correspondence with one of the many unsung behind-the-scenes heroes of the artistic world. True to the prompt enthusiasm of his first response, Murgatroyd proved himself an eager, accurate, and indispensable guide. Possessor of a wealth of quirky Ayckbourn-related facts, he often included extra bits of interesting information and photos that made both the researcher and the theater geek in me glow with that rare, warm satisfaction of being in the know. For example, Norman, the main character in the trilogy The Norman Conquests (of which Round and Round the Garden is the third and most structurally complete part), does not appear until 45 minutes into the first play, Table Manners because Christopher Godwin, the actor whom Ayckbourn had cast in the role, was unavailable for the first two weeks of rehearsal, and the script was altered to accommodate his schedule. It’s bits of information like this that often remind me why I came to love theater in the first place. They illustrate how the art of theater, perhaps more than any other artistic endeavor, often arises out of the practicalities of production and collaboration among artists and spaces and audiences. And also why I enjoy dramaturgy that tracks and uncovers the genesis of such collaborations, paying tribute to the behind-the-scenes people, like Simon Murgatroyd, like myself, like a huge majority of people working in professional theater . . . people quietly going about their business behind the scenes—building sets, programming lights, maintaining websites—all to foster a deeper connection among the audience, the work, the plays, the theaters, and the playwright that they love. Someday I sincerely hope to visit the town of Scarborough. Though I have become a fan of his plays, it won’t be Sir Alan Ayckbourn with whom I hope to meet up with for tea.